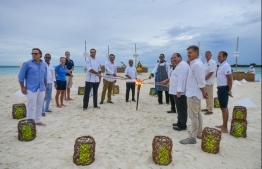 Hosted by six resorts, Soneva Fushi, Four Seasons Landaa Giraavaru, Dusit Thani, Amilla Fushi, Vakkarau Maldives and Finolhu, the first of its’ kind the Baa Atoll Summer Festival 2018 is set to officially commence this July. The festival will run through July 20 till August 3, across the six resorts. “Baa Atoll Festival 2018” offers two weeks of exclusive dining experiences, with a range of distinctive menus; the best Baa Atoll has to offer. With a set menu at over USD$120 per person, guests from the six resorts as well as visitors from other islands can experience the food culture Baa Atoll offers as a destination. The hosting resorts further offer a calendar of activities to keep the entire family entertained, ranging from beach activities to water sports and underwater experiences as well as kids’ activities and more. Sporting the UNESCO Biosphere Reserve, Baa Atoll serves as a prime destination for manta ray and whale shark expeditions. The festival will conclude with a Catamaran Regatta competition by the resort teams at Baa Atoll. Endorsed by Maldives Association of Travel Agent and Tour Operators (MATATO), the festival aims to increase the number of tourist arrivals in the Maldives, focusing on Baa Atoll as a distinct destination. The “Baa Atoll Festival 2018” is set to boost the atoll as a destination, with the best and one-of-its-kind experiences it has to offer.